Encounters on a chilly morning in the wetlands . . . The other morning was the chilliest so far this fall, and completely overcast, with occasional drizzle, so I wasn’t sure I’d see much on my walk. But I was delighted to encounter several of my favorite bird friends! The Wood Stork featured above was foraging among the marsh grasses, when he suddenly leapt up and made a tricky hop over the railing to continue his breakfast on the other side of the boardwalk. 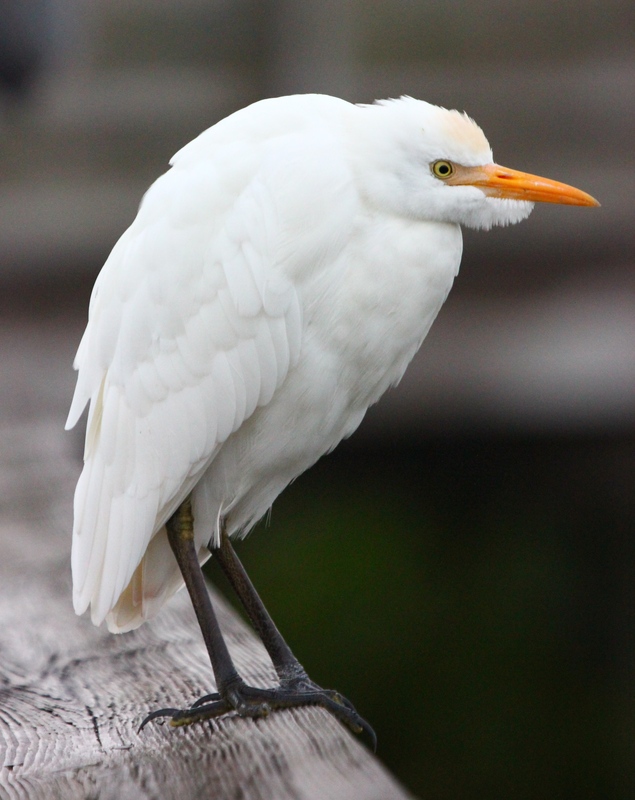 This Cattle Egret was clearly hunkering down against the weather. He stared right at me, as I zipped up my jacket, as if to be sure I noticed how much he could fluff up his feathers against the wind. 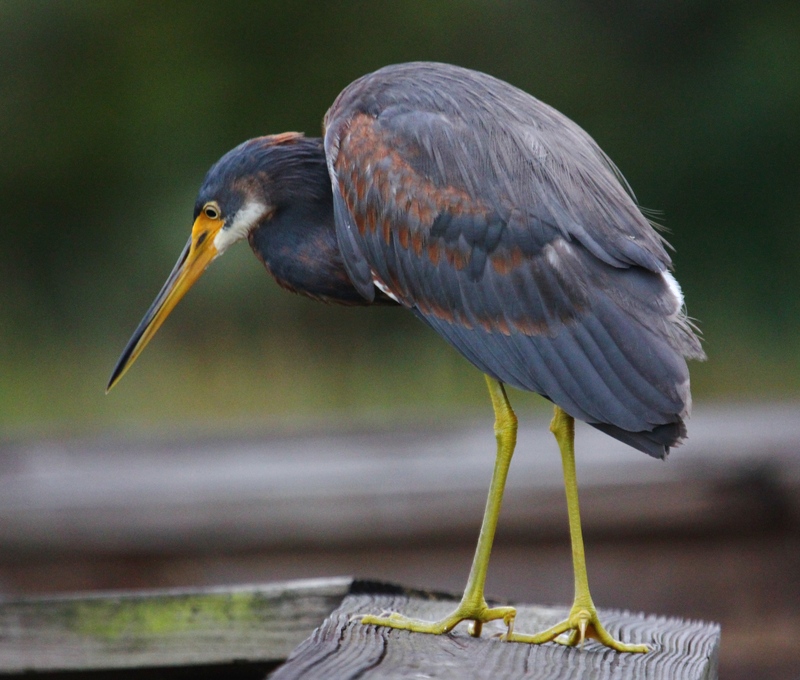 Two Tri-colored Herons were also hunched over in the damp cool morning air, hanging out as they typically do on the railing, never flinching as I walked right past them. 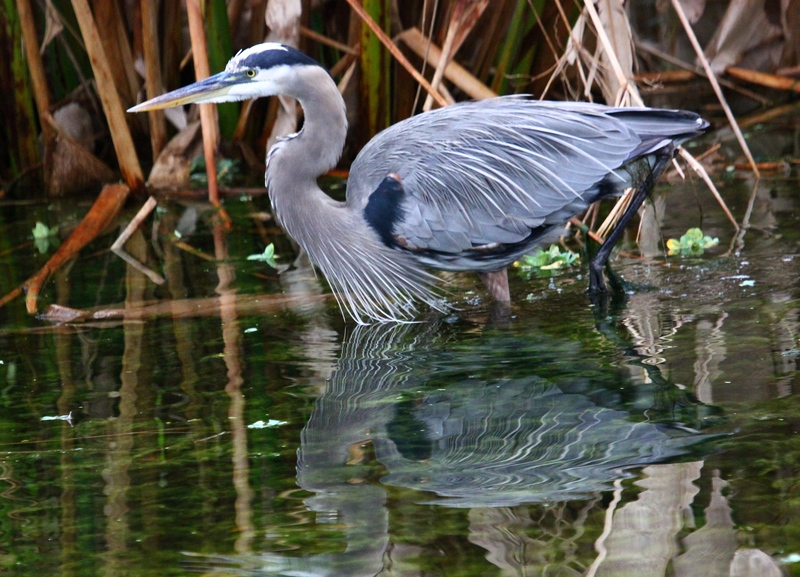 Even the Great Blue Heron seemed to be crouching extra low in the water as he stalked his morning meal. My walk was a little shorter than usual, due to the weather, but I’ll bet the fishing was great that morning! 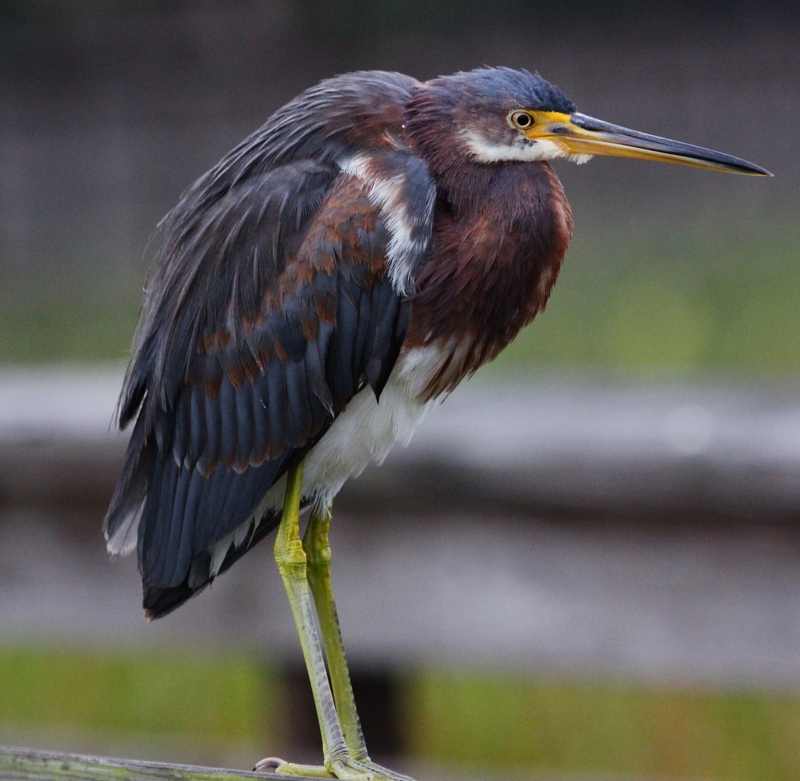 This entry was posted in Birds, Marsh/Wetlands and tagged Cattle Egret, Great Blue Heron, Tri-colored Heron, Wood Stork. Bookmark the permalink. « Looking for some fall color . . .
What a wonderful place to take a walk. It’s loaded! Very nice photos and interesting text. Thank you, Nick! Yes, we are very lucky here to have such resources. They do look cool, but what a great group of herons to look at. They are very special birds. I always appreciate your visits and feedback, Sonja! Thanks so much – it was a great walk, at a super place to enjoy wonderful wading birds! 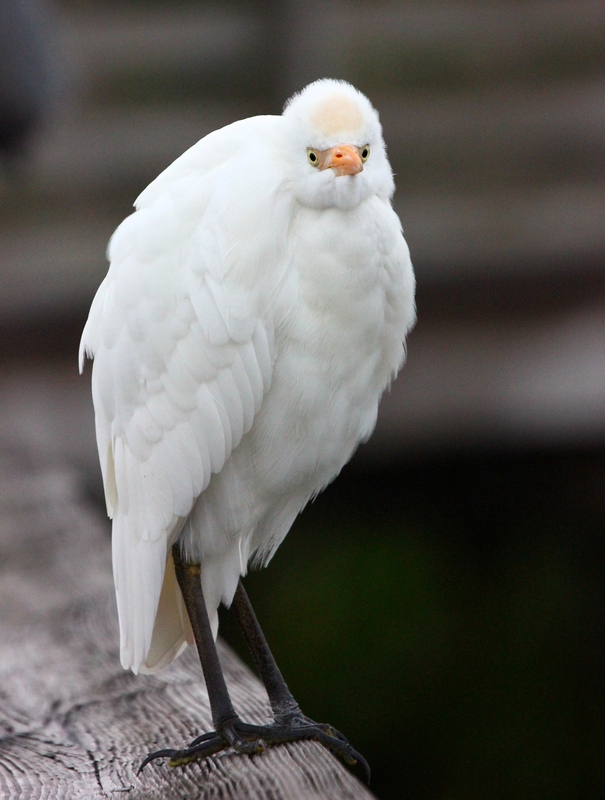 I like the cattle egret’s expression. It looks annoyed with you. Nice photos all around. Beautiful photos. I love the stalking GBH! Thank you, Pat! Yes, I like the way his front feathers are sort of drifting on the water….! Great Heron and Egret shots! I placed a few pics on my Home page for you of the Cattle Egret in breeding plumage. We love seeing these birds going through the different stages of changing colour. I have some pics of our Aussie Herons on my Photo Archive page. It is always great to meet another birder! Thanks for your visit and your comments! I look forward to checking out the pics you posted – it’s always interesting to see how different – but similar – species look in distant parts of the world!